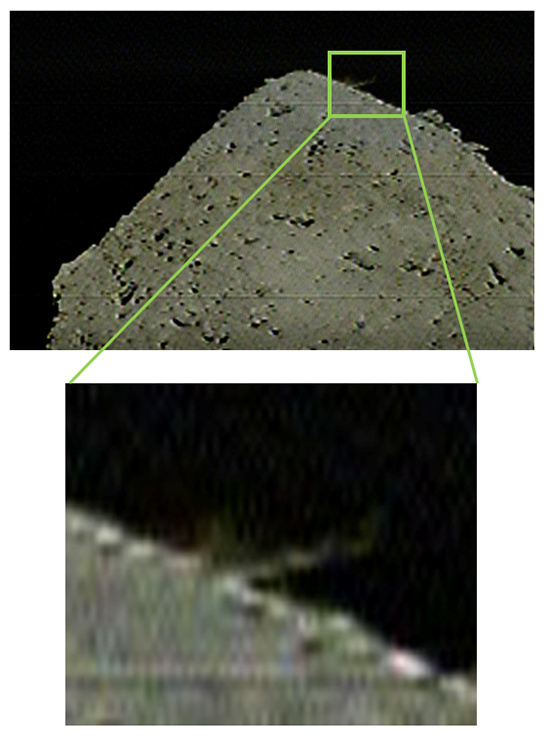 Japanese probe Hayabusa2 has shot a 2kg copper bullet at Ryugu in order to get a glimpse of the asteroid's interior. The Small Carry-on Impactor (SCI) was blasted at the rock by explosives packed behind it. The theory was that it would smack into the asteroid at 2km/s, creating a crater in the surface where the probe can collect samples. These samples will be "fresh" compared to what the bot has already scooped. Hayabusa2 descended to 500m from the surface of the asteroid in the early hours of this morning (11:13 JST) and released the SCI along with a camera (DCAM3) to keep an eye on things. It then returned to an altitude of 20km, out of harm's way, with the impactor scheduled to do its thing at 11:53 JST. The team was able to confirm that an impact did indeed occur as imagery from DCAM3 was relayed back to Earth showing ejecta flung from Ryugu's surface. The next step, if a crater has indeed been created, will be for boffins to send the probe back to the surface to collect the pristine samples ahead of a return to Earth next year. While the Japanese were attempting to blow a hole in a heavenly body, Israeli outfit SpaceIL was over the Moon to be, er, orbiting the Moon. The gang confirmed last night that the spacecraft Beresheet had entered an elliptical lunar orbit ahead of a descent to the surface on 11 April. This morning the team shared images snapped by the plucky probe. Hopefully the landing will be a little softer than Japan's intentionally explosive efforts. Engineers have been gently firing the probe's engine to raise its orbit in order to be captured by the Moon. A miscalculation or failure last night could have seen Beresheet sent on an altogether different mission, into deep space. The team has, after all, suffered its fair share of issues along the way.